When hail damage strikes your home or business, get 24 hour emergency service from a roofing company you can trust. 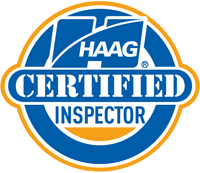 We’re A+ rated, we’re HAAG certified inspectors, we’re licensed, we’re insured, and with over 30 years in business and more than 20,000+ roofing jobs completed, we have the experience and the expertise to repair your hail damaged roof. ★★★★★ Had damaged roofing and gutters replaced from a major hail storm last year. Tallent Roofing is an outstanding company to do business with. Very professional staff handled the insurance claim and followed up on all repair details. Highly recommended. Storms are common in El Paso. In addition to heavy rain, many storms bring high winds and large hail which can damage your roof. To prevent additional damage to your roof and your home, hail damage must be repaired quickly. Here at Tallent Roofing, we excel in repairing roofs damaged from hail and other storm conditions. Whether commercial roofing or residential roofing, we work one-on-one with you and your insurance company to ensure your roof is good as new. With over 30 years in business and 20,000+ roofing jobs completed, we have the experience and the expertise to repair your hail damaged roof. We’re local. We work and live right here in the communities surrounding El Paso. We’re family owned and operated, and we provide personal attention with every roofing job. Our staff works with you one-on-one from your first call through the final inspection, ensuring you understand every step of the process and are satisfied with your new or repaired roof. Call for a quick, courteous, emergency roof repair assessment. We’ll take care of everything for you.